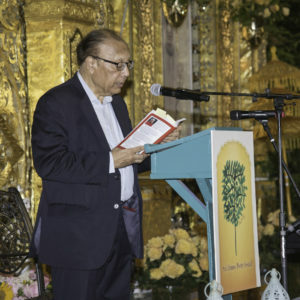 An inspired, international audience of over 700 greeted the release of the bilingual Bengali-English edition of Sri Chinmoy’s classic poetry collection The Garden of Love-Light at the annual Sri Chinmoy Poetry Festival, held on August 20, 2016 at Aspiration-Ground Meditation Garden in Jamaica Hills, NY. 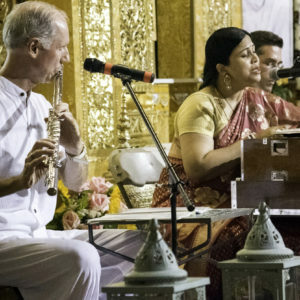 Main presenters included Ambassador Anwarul K. Chowdhury, Professor Neelima Shukla-Bhatt, and vocalist and musicians Debashree Bhattacharya, Premik Russell Tubbs and Parichayaka Hammerl. The all-women London based group Temple-Song-Hearts performed a musical prelude. 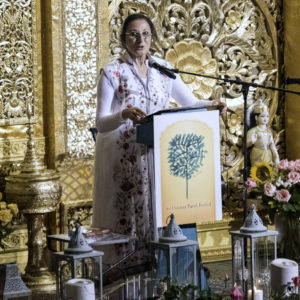 The Festival and book launch were part of a two-week cultural offering celebrating the birth anniversary of Sri Chinmoy on August 27. 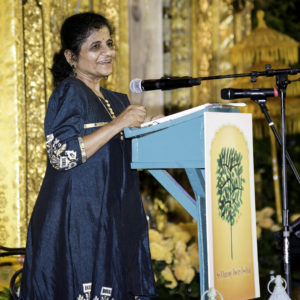 Sri Chinmoy Poetry Festival Director Ranjana K. Ghose noted that: “The Garden of Love-Light Poems of Sri Chinmoy is a work of immortal vintage poems. We find herein some of Sri Chinmoy’s earliest poetry and yet the epiphanies within are dawning ever anew, within the self and within mankind.” The book includes 140 of Sri Chinmoy’s original Bengali poems captured in both Bengali script and Western transliteration, as well as Sri Chinmoy’s own English translations. Ms. Ghose also read out a letter from President Mikhail Gorbachev on the occasion of the author’s birth anniversary. I sought You at the dawn of my life. I achieve You in the evening of my life. I have forgotten all my pangs. That is transforming my whole life. This heart of mine is in Your embrace. Poets and academics alike in the United States, Scotland, Austria, Bangladesh and India have praised the new publication. Festival Co-director Nayana Tara Hein read out several of these, including that received from Anisuzzaman, Professor Emeritus at the University of Dhaka: “…In diction, metaphor and metre [the verses] remind the reader of the tradition of Bengali mystic poems, yet the mark of Sri Chinmoy’s individual thoughts and feelings is obvious. His message of humanity and love in this time of strife and stress will surely inspire the readers to walk the path of peace and friendship for all.” Comments from around the world are included in the new edition. The Sri Chinmoy Poetry Festival is an annual event, held in New York since 2009. Libraries and university departments wishing to obtain a complimentary copy of The Garden of Love-Light Poems of Sri Chinmoy may contact 347-773-8369 or Inquiries@ArtofSriChinmoy.org. The Sri Chinmoy Poetry Festival is a real festival— occurring every summer in New York since 2009. It is also a timeless and universal festival, offered on this site, which captures the summer festivals and celebrates both the works of Sri Chinmoy and the genre he loved so well, poetry.